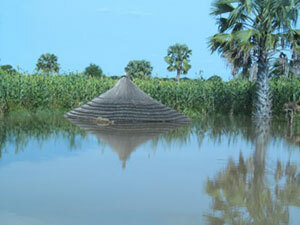 Tonj is in the state of Warrap, well known in South Sudan for flooding during the rainy season. Around 10,000 homes are affected every year, mostly near to river banks. This year the World Health Organization estimated over 70,000 homes were affected, destroying houses, crops, basic infrastructure and roads. Our clinic has also seen a marked increase in the number of malaria cases as well as waterborne diseases like diarrhea and respiratory infections. And to make matters worse livestock diseases have also increased and in danger as grasslands are covered with water. We would ask you to please pray for our team as we seek the Lord’s guidance and wisdom on how we can best assist those that have lost everything. If you would like to help please go to our website to donate. Due to the severity of the flooding we have not been able to get to Maloney in over 2 months. Please join us in praying for the church and the people there. We know the after effects of this flooding will have devastating consequences for months ahead. After our church plant in Maloney we saw a revival among the people there. We are praying this newfound faith will keep the church in perfect peace as they trust in the Lord during this challenging time of flooding. As our vehicle has not been able to pass on the road it has been tough not to be able to reach the church there. We are so thankful for Pastor Santino and the commitment he has made to the people of Maloney. A year ago he shared the gospel with Mary Abuk. Mary had previously lost a child, had gone to the witch doctor and was riddled with fear. She had no hope and against her family’s wishes she went to church to ask for prayer. She has been faithfully attending and is now one of the CHE participants. She had a huge desire to get baptized and came to Tonj where Sabet and Pastor John were able to baptize her in the Tonj river. Maloney is tucked away in one of the remotest corners on this planet, and yet we are witnessing the power of the Holy Spirit at work in people’s hearts and their desire to obey God’s Word. It is so encouraging to see this fruit after 4 years of serving there. Our family has not had a furlough since 2008 and we are very excited to be able to finally travel in 2014 with Agum. Thanks to our amazing God, the American Embassy in Nairobi agreed to issue us with a three month visitor visa which will enable us to get some quality family time and visit family, friends, ministry partners and churches. We are planning to arrive in California for the Calvary Chapel Missions Conference in early January. In light of this news, we are hoping to connect with as many of you as we can. We are requesting if you have a church, home group, bible study or small group that would be interested in hearing about our ministry work in South Sudan, please can you contact us so we can start to schedule and plan our time in America? We would be so blessed to have the opportunity to share what the Lord is doing through our family and ministry in South Sudan. We are also in need of accommodation and a vehicle to use while we are stateside, please email or call Dena if you are able to help us with either of those needs. We are so thankful for each one of you and your prayers for us.